Australian photographer Mark Gee has beaten more than a thousand amateur and professional photographers from around the planet to win the title Astronomy Photographer of the Year 2013. The competition is run by the Royal Observatory Greenwich and BBC Sky at Night Magazine. Click here to see these pictures from the heavens which declare the glory of God! Is it biblical to forgive yourself? Quick. . .where in the Bible will find the command to “forgive yourself”? Where is this either clearly commanded or even illustrated or exemplified? Can you think of any passage or verse? Why is it that many times people are told they have to forgive themselves or you hear people say, “I know God has forgiven me, but I just can’t forgive myself.” Is that biblical language? Rick offers some biblical reflection and counsel when you struggle to forgive yourself. The Gospel came to take care of my sin problem because I could not. My job should be simple: apply the Gospel to my life. I must ask, receive, and apply God’s forgiveness to my life. If you are like me, a person who can become overly shocked by sin, then maybe you need to repent of self-righteousness. This is what I have to do when I think my sin is greater than God’s ability to forgive. Sometimes I can forget how Jesus is enough for all my sin. How about you? Are you able to rest in God’s forgiveness? Why do you feel the need to forgive yourself when infinite God gave an infinite gift to pay for your infinite offense against Him? Can we finally start talking about persecution? In recent weeks, we have Muslims killing Christians in Kenya, Egypt, Pakistan and Syria. Again. Can we finally start talking about the global persecution of Christians and other non-Muslims? Finally? Please? . . . .
Read the rest of Mollie’s article here. Randy Alcorn lists sixteen biblical truths about sexual purity. It is a good list to look over and re-visit from time to time, especially since we live in a world where every day our consciences are assaulted with cries that promise that impurity is OK. Even if you are no longer a virgin you can and should commit yourself to secondary virginity—to remain sexually pure from this day forward, preserving yourself only for your marriage partner, should God choose to give you one. You need more than good intentions to maintain your purity—you need a plan. If you are committed to a relationship with a growing Christian discuss it honestly and formulate a plan to prevent falling back into premarital intimacy. Here’s a neat way for moms and dads of both small and grown up sons to pray in October. Mike Leake is forming a group that will add focus, accountability, challenge, and encouragement to your prayers as you join others in praying for your sons! Join today and start praying for your sons. Who will join me? 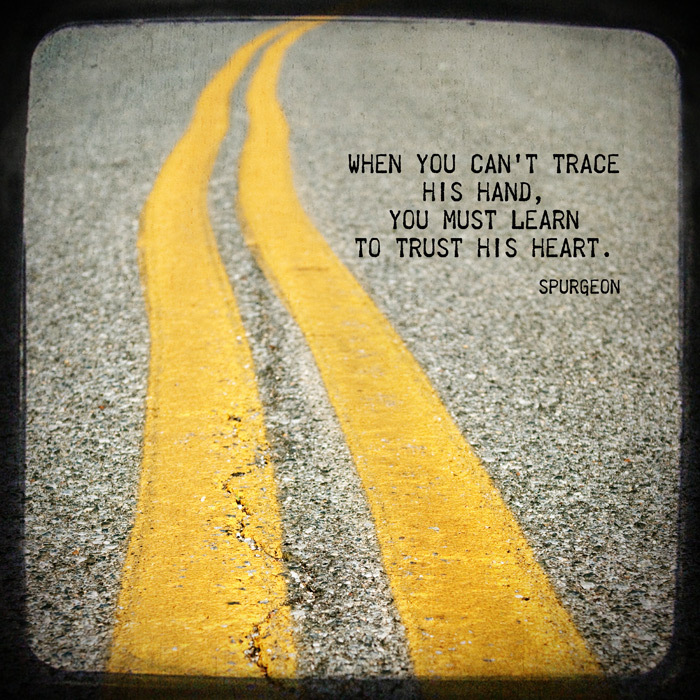 When you can’t trace God’s hand.. .